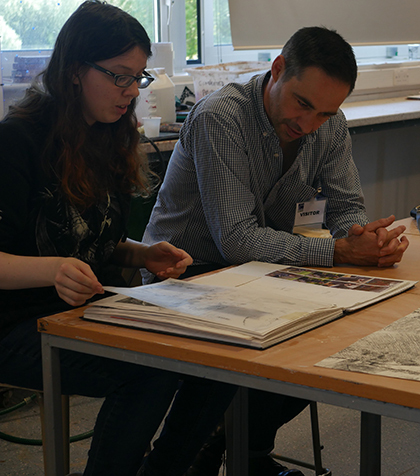 A respected painter, nominated for the PB Portrait Awards on eight occasions, visited Art students at The Sixth Form College, Solihull recently to deliver tutorials and award a prize for the stand-out artwork this year. The Stephen Earl-Rogers Award was given to Year 12 Fine Art student Jessica Skidmore (aged 17, from Birmingham). She beat off competition from many other gifted students with her mono print. Stephen Earl-Rogers said choosing a winner to be incredibly difficult and he was impressed with the standard of work produced this year. Stephen spent time talking to many of the Fine Art students about their work to discover their motivation, what they were trying to say with their artwork and how they would develop their work further. He was able to offer constructive advice about the individual works of art and what students could do to develop their talent in the future.